APT’s founders deliberately sought an outdoor setting, affirming for actor and audience alike the inspiration that many of the great playwrights derived from the natural world. Here, in this setting, playgoers experience first hand the sights and sounds; the forces and elements of nature so evident in these great stories: trees, flowers, birds (and other winged creatures), stars, moon, wind and weather. As stewards of the land we take great pride our restoration efforts to accommodate the many rare and diverse species that live here. We invite you to experience the unique beauty, and to learn about the rich natural heritage of this land on which we are privileged to make our home. 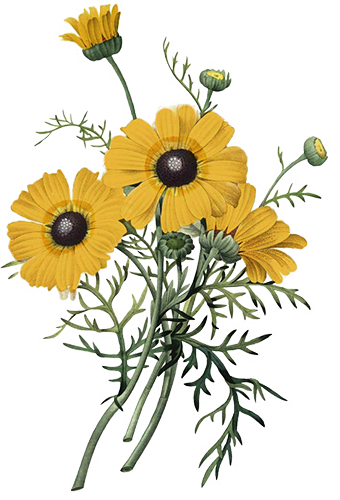 Our prairies consist of both native grasses and prairie wildflowers, also known as forbs. Their colorful blooms attract bees, butterflies and other pollinating insects. To get enough sunlight, forbs tend to match the height of the grasses. Look for low-growing forbs in the spring, when grasses are still short. Summer and fall forbs are much taller. Mesic: Some water, medium-deep silt or sandy loam (soil with sand, silt and clay), good drainage. In 2008, APT started restoring a six-acre area on the eastern edge of the property back to its historical oak savanna condition. A savanna is generally defined as a plant community where a low density of trees allows grasses and other herbaceous vegetation to become dominant. Oak savanna is one of the most threatened plant communities in the Midwest and many of the associated wildlife that rely upon this habitat, such as red-headed woodpeckers and whippoorwills, are considered rare. Removing encroaching invasive tree and brush species allows for the regeneration of desirable trees and shrubs, and an expanded habitat for nesting bird species. In the fall of 2012, with the help of volunteers from the Ice Age Trail Alliance, APT staff and volunteers began building a nature trail that takes visitors through the savanna. APT has been battling invasive plants for many years. It is a labor-intensive endeavor, which includes cutting, pulling, digging, spot treating with herbicide and/or burning at specific times during the season to try to disrupt the growth and seed set of these exotic plants. Some of the species you may see include garlic mustard, Eurasian honeysuckle, buckthorn, Japanese barberry, sweet white clover, autumn olive and multi-flora rose. While it is unlikely we will be able to eliminate all of these species entirely, with persistent effort we will be able to keep the populations at a manageable level that does not completely alter the native ecosystem. Each spring more than 75 volunteers join APT staff to weed out invasive plants. If you're interested in taking part of the annual weed pull, keep an eye on our Volunteer page. Butterfly Resort: In 2014 we became registered as a Monarch Waystation. These are places that provide resources necessary for monarch butterflies to produce successive generations and sustain their migration. For more information on Monarch Waystations visit MonarchWatch.org. 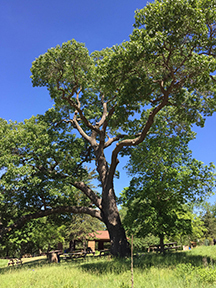 Our Champion Tree: In 2013 our signature black oak, located near the pavilion picnic shelter, was measured and named a Champion Tree or one of the largest of the species. At that time it was found to be the fourth largest black oak in the state of Wisconsin. Sadly, on July 25, 2017 the beloved oak fell, having succumbed to old age. Some of the wood was harvested to be used in furniture and artwork, and acorns have been planted so that a new generation will one day enjoy the sun-dappled beauty supplied by these magnificent trees. For more information, download the APT Prairie Guide. APT's campus is ever-growing, especially with the Next Great Stage Project, which will be completed this June. The following is a guide to the facilities at APT. The Gateway Building: Among the first buildings you'll see when you arrive. Located on the north side of the parking lot, it is home to the Box Office, one of the Gift Shops and restrooms. Lower Concessions: A concession stand located in the picnic area, just above Gateway. Open two hours before show time, this is the location to pick up pre-ordered picnics from Hubbard Avenue Diner. Sandwiches, snacks and beverages including wine by the bottle are also available. Shuttle Stop: A small shelter located at the east end of the parking lot, near the Gateway building. Shuttles to both theaters depart from this location. Accessible parking is available nearby. The Picnic Shelter: A large covered shelter located near the west end of the parking lot. With the exception of a few days each season, It is available for picnics. The Pavilion: A smaller covered shelter located near the east end of the parking lot, the Pavilion is available for group rentals. It is also the location for Fat Jacks Barbecue on select Sundays throughout the season. When not rented, it is available for picnics. The Star Tent: A large white star-shaped tent located in the center of the picnic area between the entrance of the two paths to the Hill Theatre. This is the site of the Beyond the Plays Talks and some Backstage Series events. The Star Tent is also available for group rentals and when not in use is available for picnics. Read more about the Hill Theatre and Touchstone Theatre here. APT's production facilities are not generally open to the public, though tours are available. The Alpha Center: Built in 2009, the Alpha Center opened at the same time as the Touchstone Theatre. It houses the scene shop, scene painting shop, a rehearsal hall and the Voice and Text department. The Dressing Rooms: This building was originally built in 1990 but has re-opened after a major renovation and expansion. It is located behind the Hill Theatre and can accommodate 40 actors. The Clubhouse: Newly constructed in 2017, this is where scenery is stored when it's not on stage. The building also includes production staff offices and long-term storage. The Robert Dohmen Rehearsal Studio: Newly constructed in 2017, the Dohmen houses three rehearsal halls and was made possible by a gift from Robert Dohmen. For your snacking pleasure, APT offers three concessions stands. One in the center of the picnic area, just above the Gateway Box Office building (also where you pick up pre-ordered picnic dinners), and one each in the Hill Theatre and Touchstone lobbies. Each concession stand offers a selection of beverages, including coffee, wine, beer and soda, as well as snacks. The concession stand in the picnic area also offers made-to-order sandwiches and wine by the bottle to share with your group. Some of our most popular items include: heavenly brownies from Hubbard Avenue Diner, Furthermore Proper beer (brewed in honor of APT), Dove ice cream bars and, believe it or not, gummy bears. You are welcome to take snacks and drinks to your seat. After October 6, the Touchstone concession stand is open, but the Hill lobby and picnic area concessions are closed. Forget your cork screw? Looking for a birthday present? Need an APT t-shirt fix? Our gift shops have what you need (and maybe some things you don't realize you need until you see them). Gateway: open two hours before a performance. Hill Theatre: open one hour before a performance, at intermission and following the performance. Touchstone Theatre: open one hour before a the performance, at intermission and following the performance. We don't currently offer an online gift shop. However, if you see something special during your trip that you decide later you can't live without, please email Shop Manager Lisa Scofield. She'll do her best to track down and ship the item to you. The shop in the Gateway Building next to the patron parking lot and the shop in the lobby of the Hill Theatre are open June 8 - October 6, 2019. The Touchstone shop is open through November 17.